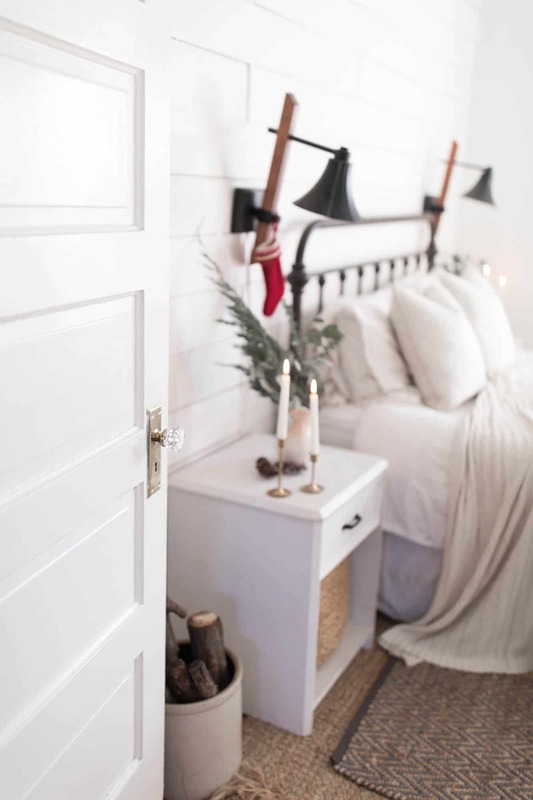 Natural Christmas Decorations, like greenery, pine cones and wood make our farmhouse bedroom cozy for the holiday season. 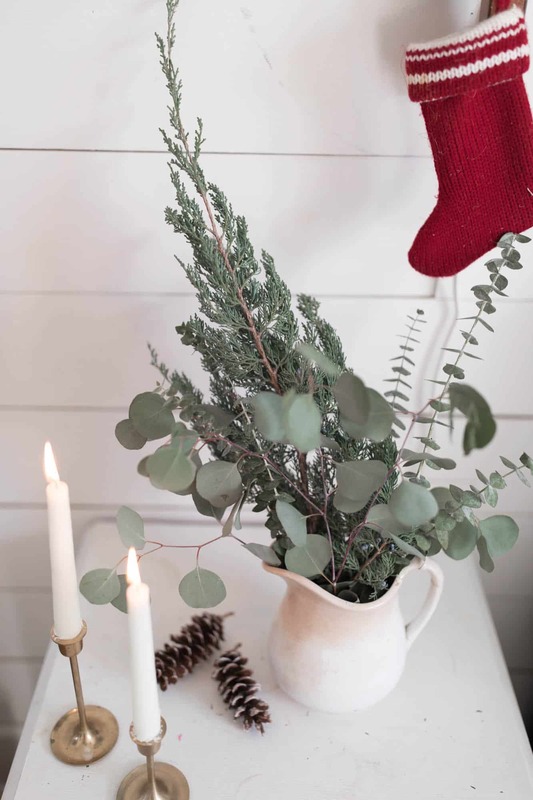 Natural Christmas decorations are my go to each holiday season. They are simple to incorporate, easy to discard at the end of the season and look beautiful in any space. 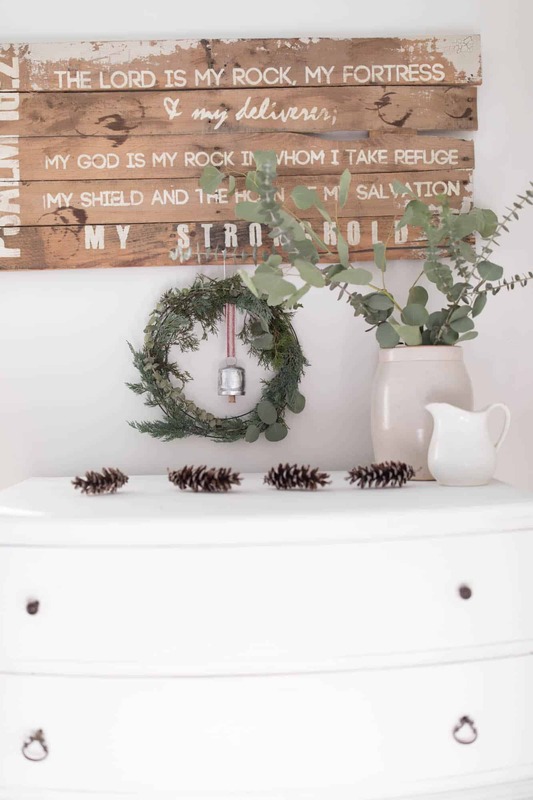 I teamed up with nine of my blogger friends for this holiday home tour. 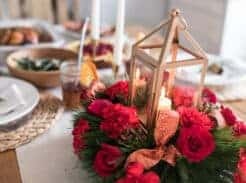 Be sure to read all the way to the end of this post to visit the other lovely homes full of Christmas inspiration. Thanks to Marci from Lemons to Lovelys for putting this blog hop together! Not one to be super organized, storing extra decor between the seasons stresses me out. The advantage of using natural elements for decor is not having to keep multiple bins in the basement. I clip fresh greenery and gather pine cones, enjoy them and then get rid of them. 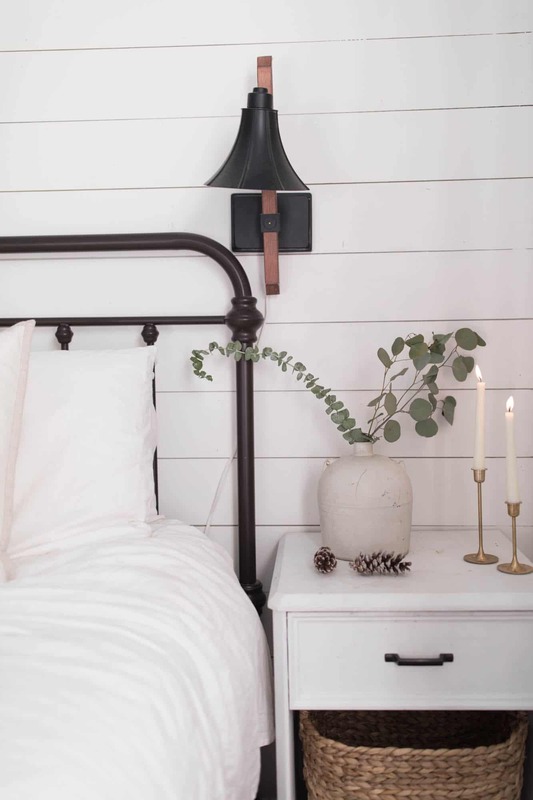 An antique ironstone pitcher with stems of fresh eucalyptus and cedar, paired next to a few sap covered pine cones and brass candlesticks add simple Christmas charm to our chalk painted night stand. 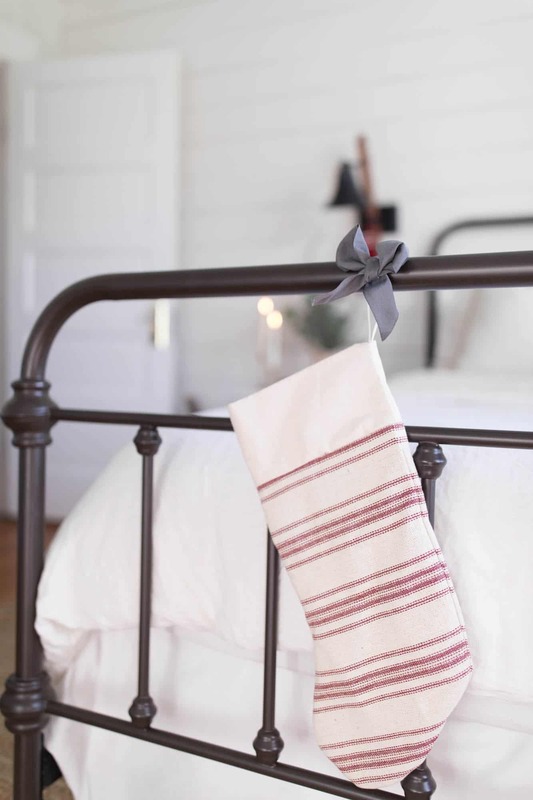 The focus this year for our farmhouse Christmas bedroom was cozy. 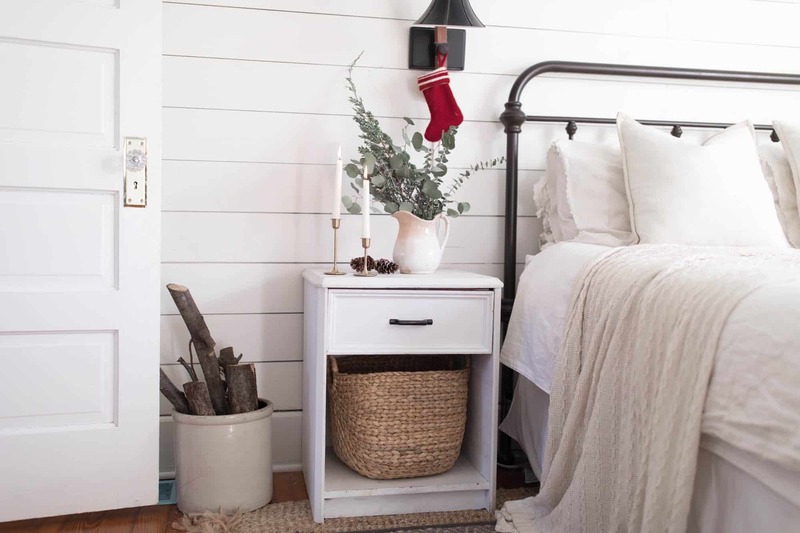 Layered jute rugs, a ceramic crock full of firewood, grain sack, wicker and knit stockings and blankets bring in the warm textures. Candles look pretty year round, but they are especially inviting in the cooler months. 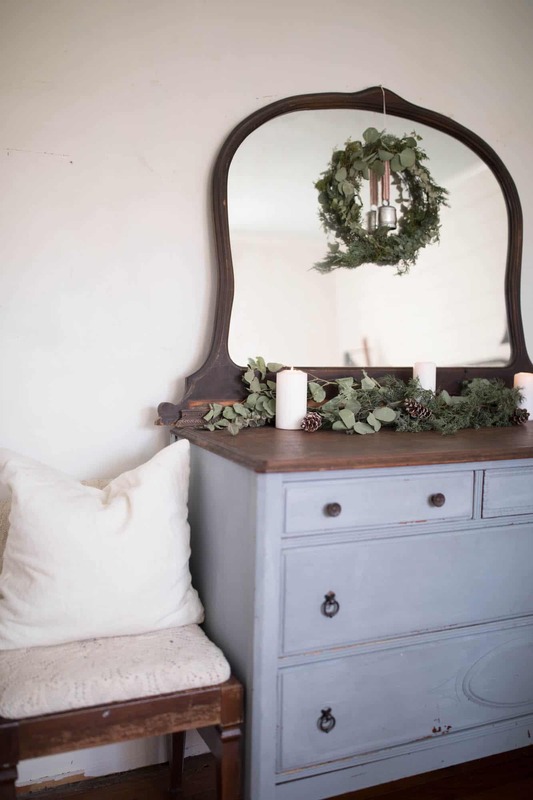 I layered fresh greenery, like silver dollar eucalyptus, cedar and pine as a garland along our milk painted dresser. 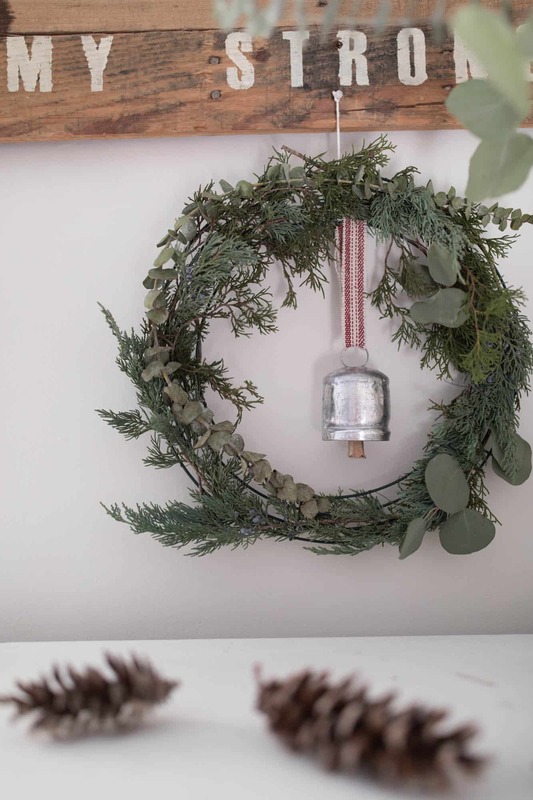 Last week I shared a tutorial on how to make simple fresh greenery wreaths. 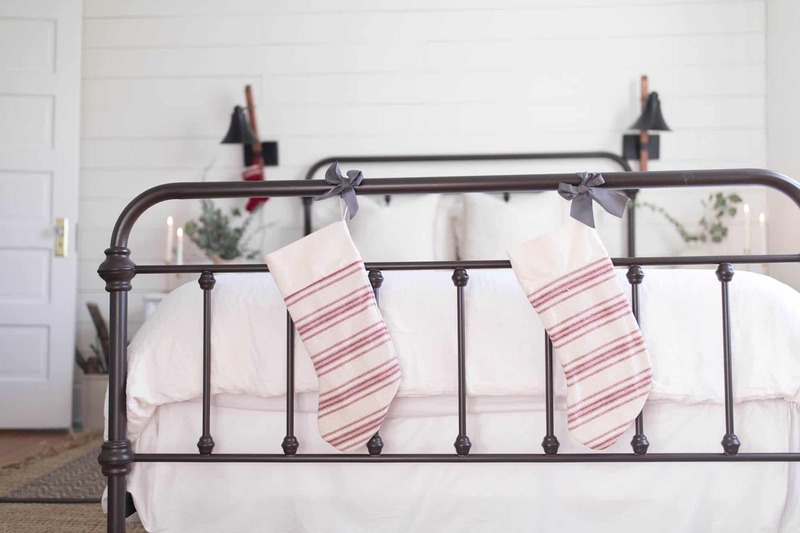 I added two of them to our farmhouse Christmas bedroom. I secured these bells from World Market onto the wreath with a strip of grain sack fabric and a little hot glue. On the other side of the bed I added a little eucalyptus to an antique crock. I found this one for just a few bucks at my favorite thrift shop. I did a video on finding farmhouse decor at the thrift shop on my Youtube channel. The grain sack stockings on the end of the bed I made in my sewing room. I added another one of my handmade wreaths above the other dresser. They have sort of a messy, imperfect look to them. But I like them that way! 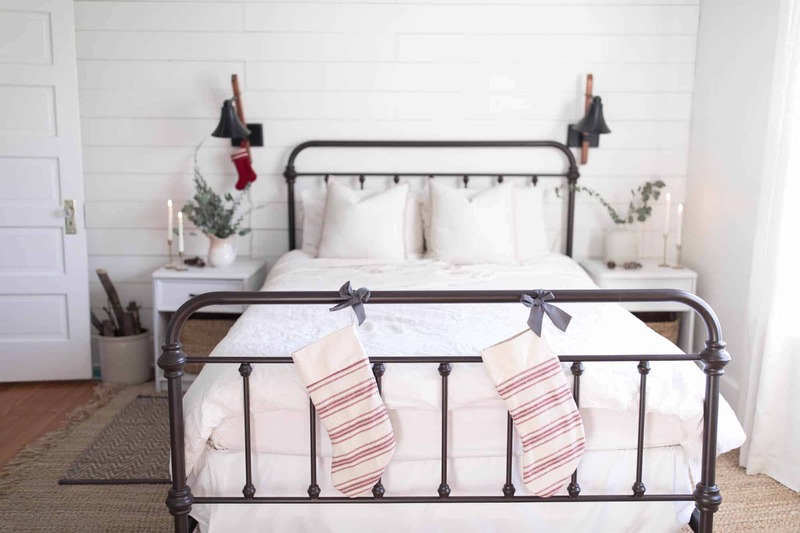 Thank you so much for stopping by the farmhouse for my cozy Christmas Bedroom Tour! 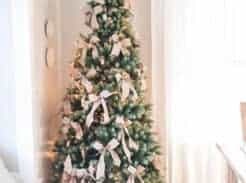 Now go stop by all the other lovely homes for more Christmas inspiration! LOVE the eucalyptus Lisa!!! Where did you get those candle stick holders? I’ve been looking for some just like that! Thanks for doing this tour with us! Now the baby can come! This is so pretty. I love the natural beauty and touches of red. It looks like a wonderful Christmas at your house! Looks so pretty. You have inspired me to decorate my home. Thank you! Lisa your home is absolutely beautiful. Love the fresh greenery! I have about 30-40 Eucalyptus trees on my property and never thought of using them as you did. Love this idea!!! I love all natural decor and when it is made with such a style like yours everything looks stunning! 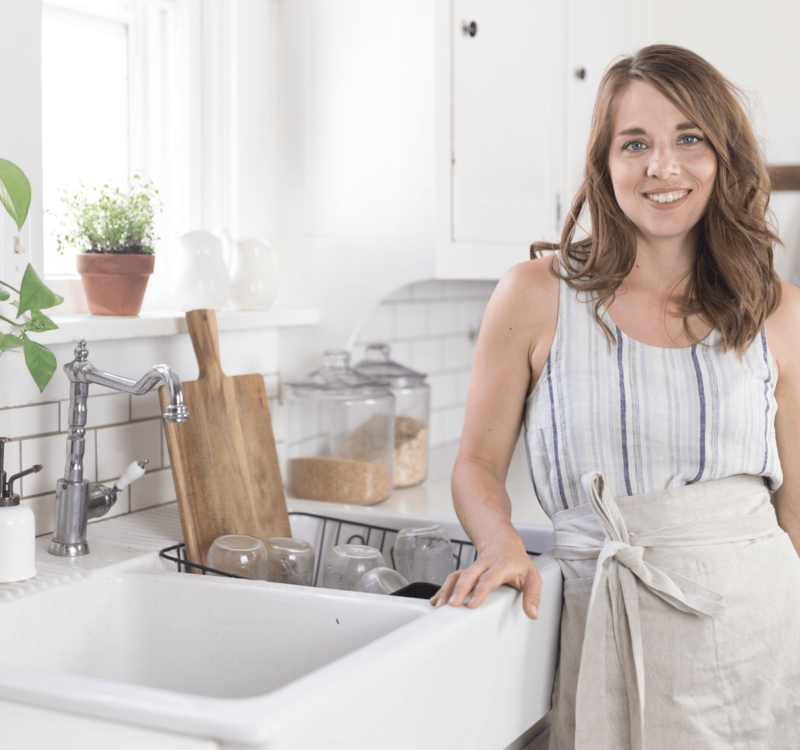 I am excited to have found your beautiful blog via this hop, now following! Your room is lovely, cozy and inviting and I love everything you have done. Could I asked where you purchased those neat lamps on the wall. I love the unique look of them and they are perfect in your room. Thanks for sharing with all of us. Thank you so much Connie! Those were actually a garage sale find. 🙂 I wish I could tell you a better source than that! So beautiful, Lisa! 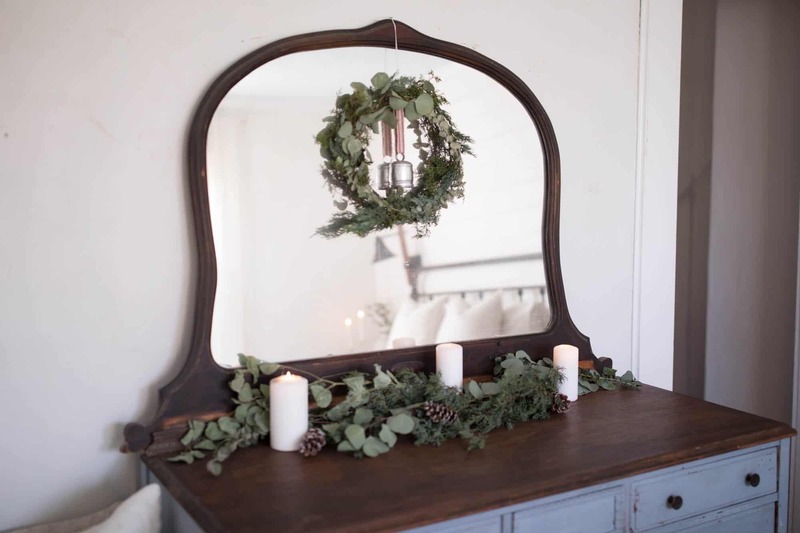 Love the simplicity of your wreath too!